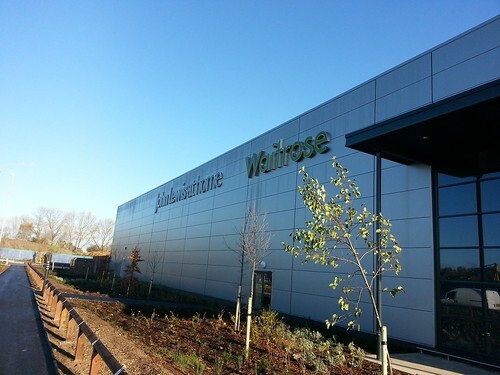 Last Sunday I headed out to map the new Waitrose and John Lewis at Home stores in Ipswich that recently opened. 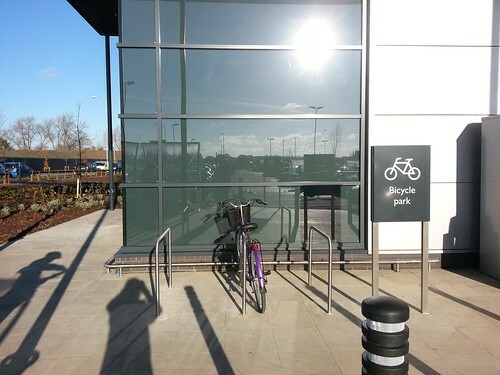 I also took a look at what the cycling facilities of the new store were like and got them mapped into OpenStreetMap. The building outlines were in OSM already, as were the roads that were previously in OSM as being under construction had already been converted to active roads by someone else already. The access roads all have shared legal cycling on the pavement that are a reasonable width, which is a great start. 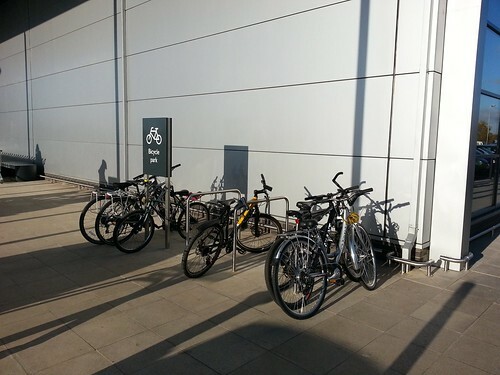 There is however only 2 sets of 6 spaces for parking bicycles at opposite ends of the store. When I visited, there had been so much demand that people were tying their bike against the sign telling them where the bike park was on the currently more obvious one to park at due to it being nearer the entrance. I’d have expected there to be more cycle parking especially when the car park was over flowing and encouraging more people to cycle would reduce the demands for their over full car park. This entry was posted in Cycling on November 18, 2012 by smsm1986. I’ve recently upgraded from Sky’s ADSL2+ product to their Fibre to the Cabinet (FTTC) internet package. This has a dramatically improved data speed from about 4Mb/sec downstream and 0.4-0.6 Mb/sec upstream, to just under 40 Mb/sec down and 10 Mb/sec upstream. After the new router and BT Openreach modem had been installed I found that I couldn’t connect to devices that were connected to the Sky modem via ethernet, however connecting to them over wifi worked fine. Sky have setup their modems such that they can auto detect whether it’s a Fibre connection via a BT Openreach modem, or via ASDL and choose the right configuration. 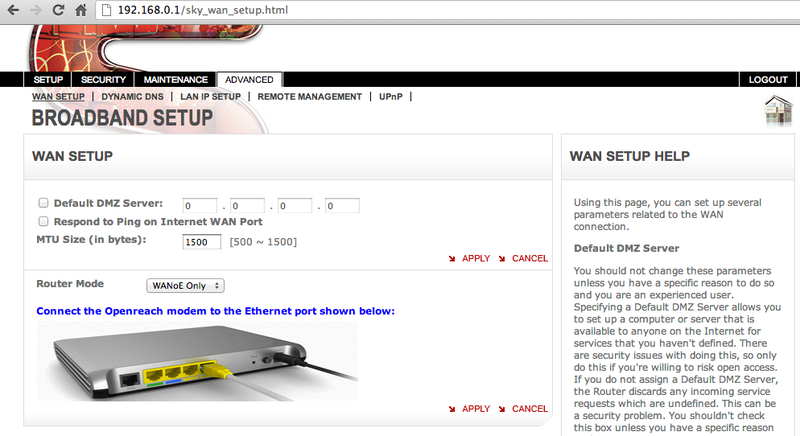 I spent a week or so wondering what was going, and why I couldn’t connect to other devices on the local network even by ip address and port number, however if they had a service that had been setup through UPnP, then I could access them from other external networks fine. I thought I’d take a further look and see how it affected things. Simply changing it to “WANoE only” mode for FTTC and ensuring that the BT OpenReach router was plugged into the correct ethernet port as shown in the picture under the setting fixed the issue. It seems that in auto mode the firewall is setup for all ethernet ports rather than just the one that the Openreach modem is connected to, until you change to the specific setup. Hopefully this info will help someone else if they come across the same issue. Update 22/11/2012: I’ve found that the router can seeming forget the above setting, even so being set to it, thus forcing the setting again is needed. Hopefully Sky will resolve the issue at some point. This entry was posted in Internet on November 18, 2012 by smsm1986.